Acrylic solution dyed fabrics integrate perfectly in any outdoor space creating protection from the sun and elements and adding a touch of color and elegance. This fabric is ideally suited for retractable awnings and stationary fabric canopies providing comfort in the heat of the summer. Acrylic fibers are saturated with highly UV stable pigments. These fabrics are breathable creating a comfortable space below that is mildew and fade resistant. Some Acrylic fabrics like Tempotest® from Para has a water repellant Teflon® coating. Feel free to choose one of our solid or striped colors from our stock signature PARA Tempotest® fabric collection or one of our other available great fabric brands like Sattler, Dickson, Recacril, and Sunbrella by Glen Raven Mills. Our exclusive PARA® Tempotest collection has a full array of solid and striped patterns. We invite you to review the patterns below. Note: The color will vary slightly from the actual fabric swatch. Your SUNAIR® dealer will be happy give you a free estimate and show you the collection in person. What is solution Dyed fabric and how is it made? POLYACRYLIC (or more simply acrylic) fibre is a general term used to describe all those fibres containing at least 85% of acrylonitrile monomer. The solution dyed acrylic fibre represents today the material mainly used all over the world in the production of outdoor covers such as sun protection , marine covers, and garden furniture. Of course, to obtain an excellent acrylic fabric for outdoor uses, it is of course necessary to use the best fibre available. But, careful consideration for the spinning, weaving and finishing is very important. Quality control is of fundamental importance. Only if all three functions are performed with absolute quality in mind is it possible to obtain a fabric with features suitable for outdoor purposes and retractable awning and shade use. At the end of the weaving, the fabric is submitted to the FINISHING process, which main purpose is to add further technical features to the fabric using chemical products. First, the fabric is submitted to an intense washing procedure in water and soap to remove possible impurities accumulated during the previous manufacturing phases. After that, the fabric is immersed into a basin including a mixture of chemical products that are allowed to penetrate into the fibre. Para / Tempotest uses the internationally known TEFLON coating to make the fabric water, oil and mould resistant. Now we have a fabric that will perform well on our awning systems that will last many years without fading or being soiled by dirt. Standard valance styles are listed here. Some styles may vary depending on the pattern and where the stripes fall. If a custom valance is required, create a well-dimensioned sketch with the order as well as instructions on style. 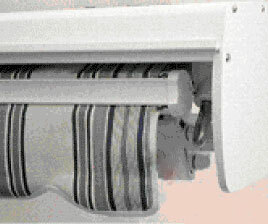 Our standard valance is "E" if no valance style is specified, we use "E".